I was hesitant to try this, we all know that strong odor that nail polish comes with. it clears out the house, or hubby/bf are complaining about the smell. I figured hey Scented polish YES! 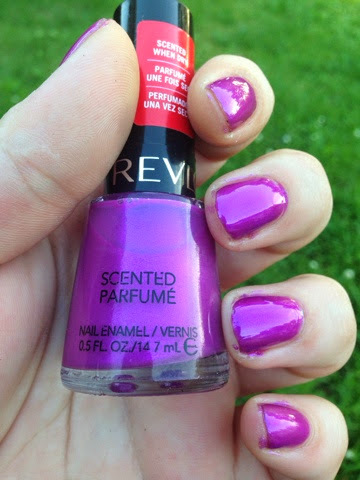 So what i am reviewing is the Revlon Scented Grape Ice 330, i got this on sale at the SALEEVENT.com website, i wanted to try it to see what it was like so i only bought one and the hubby's favorite color is purple, and i love the smell of grapes. I found the initial smell to be actually not that bad, it was a little off smelling but that would be due to the scent inside. The first coat was very sheer, by the third coat it looked like i wanted it to. Sorry for the bad pictures i was outside and getting bitten alive!!! As you can see its glossy and it has micro sparkles in it for a shimmery look. This was a great buy and for only $3.00 CND it was a great deal!! What scent would you like to try? or wish they had? I have my eyes on the orange pop!! This is so cool! I've never heard of scented nail polish before. Cool! My daughter would love this.. i will show it to her and i am sure we will have to get it. Very interesting. I am not sure what to think about the scent! 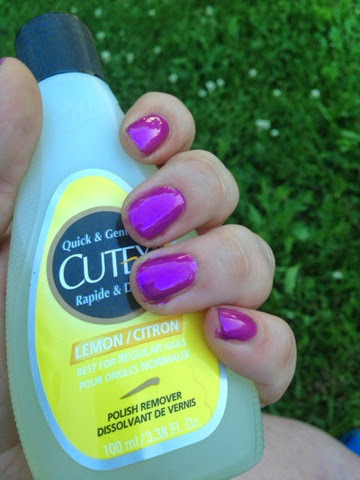 I love bright colored polishes! I didn't know nailpolishes came with different scents. I love that color. 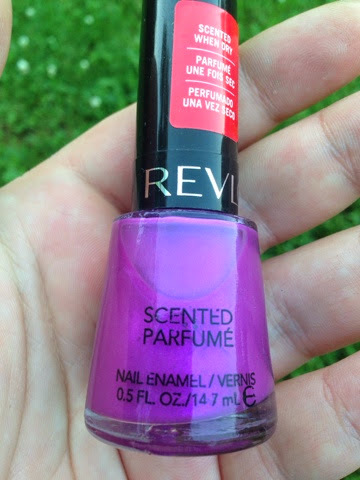 That is amazing I didn't know they made scented nail polish I will have to check this out. That's crazy! My daughter would wear her nose out sniffing her nail polish! Oh my gosh, I LOVE LOVE LOVE that color. So pretty and fun. I love that it smells like grapes too. Awesome. I love this scented nail polish, cool. I will have to get some just to try it or sniff it I should say. Thanks for sharing. scented nailpolish... I WANT SOME!! Mosquitoes have been messing up photo shoots here this year too!! I love that polish. Too bad it smells like nail polish when you first put it on. I love the color! I have a boxed filled with nail polish that I haven't gotten around to try yet. I know I have a couple of scented Revlon ones but not the grape ice! I've been wanting to try this! 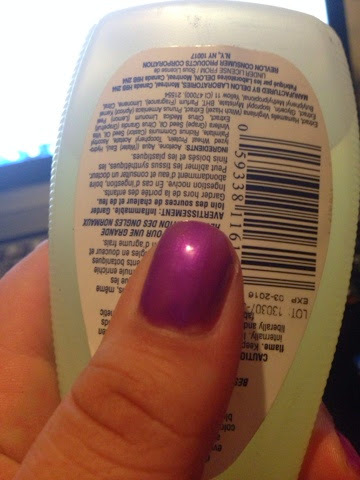 I had a polish, forget the brand, in the 90s that was scented. The color is very gorgeous! It looks kind of holographic! I like it! oh this is freakin awesome, i have to check these out. it will be fun with the kids as well. Cool, I didn't know this line was still available! Looks like a fun product.